It’s 1934 in Mulehead, Oklahoma, and the Bell family, having watched their crops and their neighbors’ wither and die in perennial drought, now face another, undreamed-of terror: the dust that destroys whatever the heat and grasshoppers have missed. As other families give up and head to California, the Bells stay put; it’s as if Meadows has reimagined The Grapes of Wrath, depicting a family born to suffer. Samuel, the good-hearted but rigid-thinking father and husband, believes that God is punishing them, and as he loses himself in religion, his wife, Annie, drifts away. Trapped in an unfulfilling marriage, she dreams of a different life, a different man, anything to escape the crushing, gray sameness. Life was mostly about remembering or waiting, Birdie thought. Remembering when things were better, waiting for things to get better again. There was never a now, never a time when you said, ‘This is it.’ You thought there would be that time–when you turned sixteen, when Cy finally kissed you, when school got out–but then you ended up waiting for something else. Take Birdie’s desires for freedom and experience, throw in a callow boy, and you can guess what will happen to her, even if you don’t read the jacket flap and its ominous, obvious hint. Likewise, since Fred has asthma, for which there’s no known cure or treatment–even if the Bells had the money to pay–you have to wonder what havoc the dust storms will wreak on the poor lad. And as if that weren’t portent enough, Annie has already lost one child, who lived a week after birth. Not a day passes that she doesn’t feel the pain. I feel two ways about the overly predictable, heartbreaking story. First and foremost, I admire I Will Send Rain for its fierce honesty. 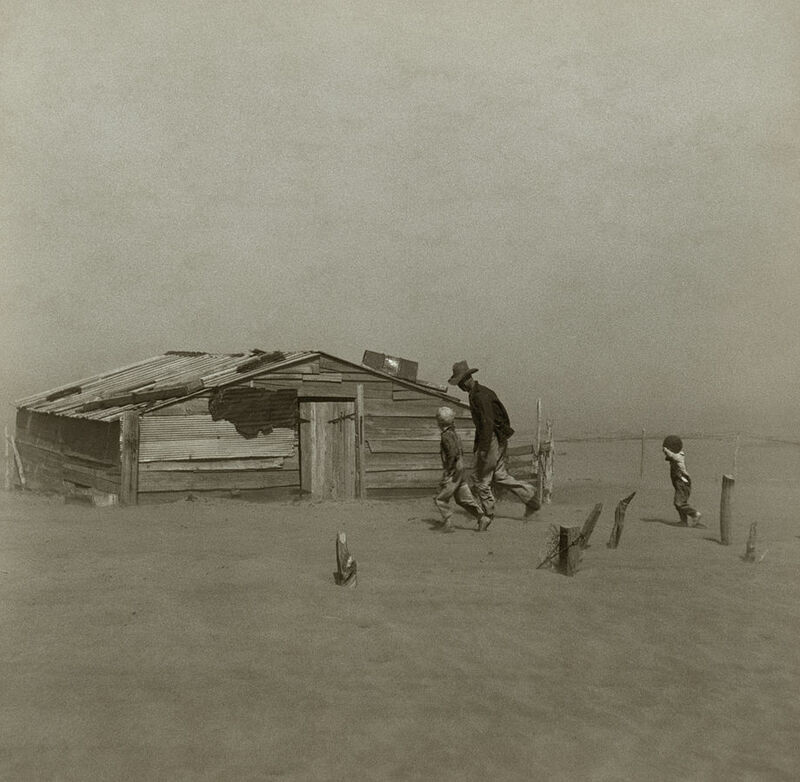 The Dust Bowl was a tragedy, and Meadows refuses to make nice with it, which means that nobody escapes. The characters have to struggle just like anyone else and can’t expect a benevolent authorial hand to bail them out. The writing, though spare, packs a wallop, and the author uses her skilled economy to convey a remarkable depth and breadth of one family’s experience, capturing the universal in the specific. Beautifully done. However, once the sequence of tragedies grabs you by the throat, what then? Since they’re predictable, the only question is how the Bells will deal with them, and here, Meadows has a difficult choice. Does she keep the pressure on, showing no more quarter than Nature, or does she relent? If she keeps the pressure on, does the book become too painful to read and ultimately unsatisfying? But if she relents in hopes of letting her characters find redemption, does that compromise the fierce honesty that put them in trouble in the first place? I think Meadows wants it both ways, but read the book to see whether you agree. Specifically, I find the resolution illogical, given that Samuel’s a Bible-thumper and Annie’s a minister’s daughter. After all, Samuel takes it into his head that God is testing him, as with Noah, and that he must build an ark. As a literary conceit, that one’s dubious, but it also suggests that Samuel’s morality has been fired in an ancient kiln and is therefore unlikely to bend. Then again, I understand Samuel less than any other character; he seems to have little or no inner life, nor to want one. I do like how he tries to involve Fred in his projects and share small secrets, which makes him more human as a father. But the way the novel unfolds, I expect a confrontation or two that somehow don’t happen, and I think that’s a mistake. All the same, I Will Send Rain has a lot going for it, and even its flaws are worth thinking about.